$1,000 Visa Gift Card Giveaway Back to School Sweepstakes! 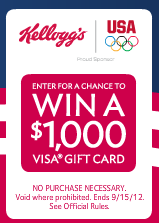 Be ready for school and enter to win a $1,000 Visa Gift Card in the Kellogg’s Back to School Sweepstakes with Amazon.com. This would be a great way to get maximum savings and use that gift card to gear your kids up for school! I shop for almost everything on Amazon.com. I am a Prime member and love getting that free shipping. I even order my Fancy Feast Gravy Lovers Chicken in Gravy Cat Food from Amazon. It’s so hard to find anywhere else! NO PURCHASE NECESSARY. Void where prohibited. Begins on 8/9/12, at 12:00:01 a.m. PT and ends on 9/15/12, at 11:59:59 p.m. PT. Must be a legal resident of the 50 U.S. or DC, 18 or older. See Official Rules for complete details. Amazon is not a sponsor of Team USA.